Sometimes, life gets away from you and you'd rather be going to the beach and spending your weekends laughing with friends than baking in the kitchen. That's the only excuse I have for being so MIA lately. Taking a bit of an impromptu break has left me with pages of ideas and recipes, so today we are starting with cookies. And there's sprinkles and chocolate. In the bowl of an electric mixer, beat 1 cup butter and all the sugar until creamy. Beat in one egg yolk at a time, then vanilla. Beat in flour, 1/2 cup at a time. Mix only until the dough comes together, don't overmix. Chill bowl with dough in the refrigerator for 10 minutes to soften slightly. Using your hands, roll dough into 1 1/2 inch balls and place 2 inches apart on a silpat-lined cookie sheet. Bake for 10 minutes. Remove the cookie sheet from the oven and using your thumb (or a 1/2 teaspoon measuring spoon), create a divot in the center of each cookie. Return to the oven and bake for an additional 3-4 minutes, until cookies are golden brown around the edges. Remove from cookie sheet and allow to cool. To make the chocolate filling, create a double boiler using a heatproof bowl over a pot of boiling water. In the bowl, whisk together the remaining 2 tbsp of butter, chopped chocolate, and corn syrup until melted and smooth. Spoon chocolate into the divots in the cookies and top with sprinkles. Allow to cool completely and store in an airtight container. 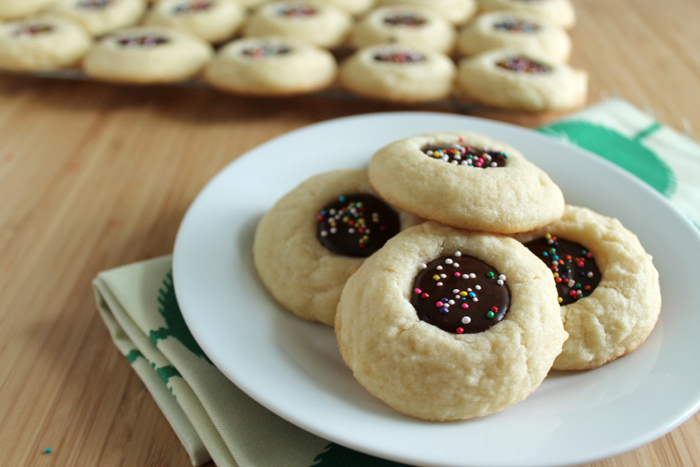 Light and buttery cookies filled with a rich chocolate filling. Sprinkles for good measure. This recipe makes enough cookies that you can give some to your neighbors and get some major props, but also shove your fair share into your mouth as well. Win, win.